By Dharmesh Mistry – The Perspectivity Game has become a valued part of the London School of Economics (LSE) Retreat at Cumberland Lodge for MSc students of the Department for International Development. Our regular sessions with them has also provided our team the opportunity to refine and develop new ways of deepening the impact of the whole session. Drawing on our efforts through 2013, two new game leaders from Exeter, Rob & Andy joined us which served as a great way to connect up experiences and ideas from across the country. Several students from different nationalities spoke to us at the end, keen to learn more with an interest to get involved. Tom started the session introducing the rules of the Game after which we split between 2 rooms to run 4 boards. The games were lively and the students were very engaged throughout. To start the debrief, the facilitators asked a series of questions to enable the students to step back and reflect on their experience. Drawing on Kolb’s learning cycles, we used a World Cafe style conversation to draw a clearer distinction between Reflection (step 2) and Generalisation (step 3) where the participants from different game boards mixed up to share their views on the following questions; Q1: What assumptions were made in the game? Q2: Where do we see the game dynamics played in real life? Q3: If we played it for a second time, what would we do differently? We then came together again in one room to summarise the key ideas from the game and share insights gained from the World Cafe. 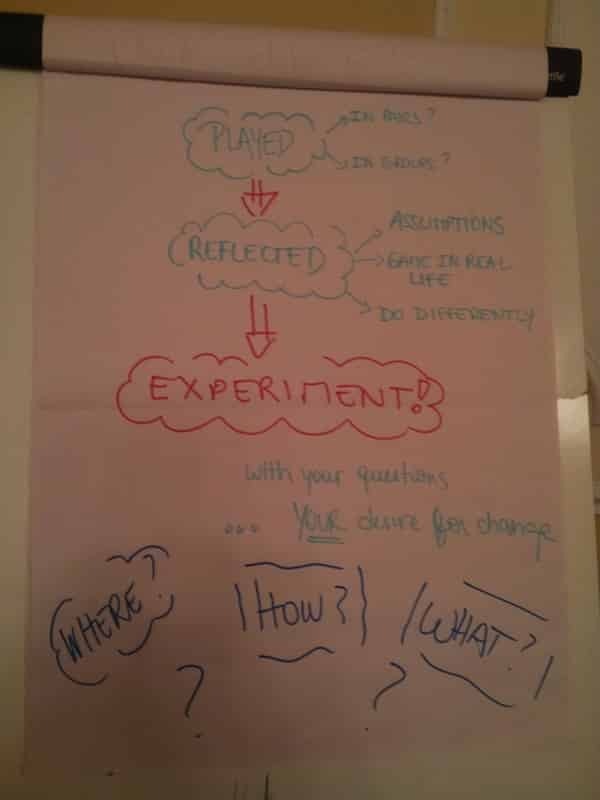 Sole Riestra, who designed the session, then continued the exploration through an Open Space inviting participants to create their own individual questions “How can we…” This enabled us to draw on Kolb’s 4th step, Application & Skills Building, where the participants apply the concepts to their own life. Many thanks for a very successful game. The whole experience was even better this year than previous years, especially because of the “lessons learned” process.